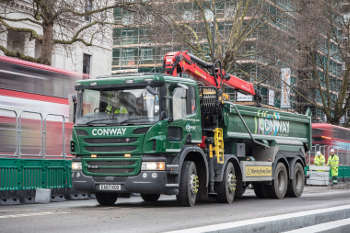 FM Conway is investing £7m in its vehicle fleet ahead of the introduction of tougher standards from next year under London’s Ultra Low Emission Zone (ULEZ). The company, which provides construction and maintenance services for roads, buildings, structures and public spaces across London and the South East, said the move was part of its ongoing efforts to lead environmental best practice within the construction industry. Peter Parle, FM Conway’s transport manager, said: ‘Whether it’s investing in plant and vehicle emission technology or cycle safety, FM Conway aims to pave the way on best practice for construction logistics. The move comes in advance of the proposed extension of London’s ULEZ. which has recently of consulted on. London mayor Sadiq Khan’s plans would see the Euro VI standard applied in central London from April 2019 and possibly expanded city-wide for lorries from 2020 and up to the north and south circular roads for all vehicles from late 2021. In total, FM Conway is investing in 25 new HGVs and 136 vehicles of (variously) 1.5 tonnes, 3.5 tonnes and 7.5 tonnes. The new purchases include sixty 7.5 tonne vehicles and 17 eight-wheel tippers, which meet Euro VI standards, to transport highway arisings and recycled-content asphalt mixes to and from FM Conway’s operational sites and its recycling plants around the capital. The addition of the new vehicles, which are due to arrive between now and the first quarter of 2019, will bring the company’s liveried fleet to over 900 vehicles. The firm said it has invested £235m in its infrastructure over the past decade to support its commitment to sustainable construction and self-delivery approach to projects, including developing its own network of materials recycling centres as well as ongoing investment in its vehicles.